If You Can't Train A Mc Nab Dog, You Don't Deserve A Dog. I read this once. It was written by a breeder of Mc Nabs out in California. It's absolutely true. The same goes for most herding dogs. Australian Kelpie, shepherds, Border Collies, German Shepherd Dogs, Poodles, all that. A lot of those undesirable behaviors are due to our subconsciously training dogs in ways we didn't expect. We have all seen those videos of dogs doing unexpected things. Labrador Retrievers standing on the Ice Dispenser button to empty the freezer of ice cubes is probably my favorite. The trick is to steer the undesirable behavior into something useful. After all, have you wondered why your dog has this weird ability to predict when that ice cube needs to be shared when you say "I need a drink"? I didn't realize that I was training my dogs, but I should have been clued in. I did this to Lettie, I certainly am doing this to Rack. Lettie would just walk away. Cause meet Effect. I would grab the camera, even if just to pop the chip out of it to read it, and she would find herself in another room. Rack is a much more gentle creature. He doesn't cast aspersions. He merely avoids. Trash truck on the street a block away? In the crate. Vacuum cleaner out of the closet? In the crate. Coffee grinder? Garbage Disposal? Toaster finishing with a snap? All in the crate. I tend to block areas off these days. He's got his crate, and he's got his mat out in the open. The rest of his hiding places are blocked off. He hasn't learned that Flash Camera Bad thing yet. He just thinks if he's being aimed at by a camera or a phone, it's going to get annoying. When people send me messages, text or email, saying what they're up to, and I feel the need to respond with the smartphone, I have been known to send weird random pictures. Someone started demanding to know where I was. Driving. So I took a picture of the "guy in front of me" and sent it back. I got the same question once when I was in the bathroom. They got a picture of my feet and the bathroom door. I was in the yard when the text barrage last happened. I took a picture of the yard and sent it to him. He was in Lorton Virginia waiting to get off the Auto Train and bored. Then I thought "Oooh! Lets try to get a picture of Rack". Made a mistake there. He doesn't understand that when I am coming after him, camera in hand, that we aren't playing a game. I scuffed my shoes on the pavement. Time to run the human. Make human tired. Go do 100 laps around the pool leaping over the milkweed pot. Pee on the Spider plant. Bark at the human because human isn't running at my speed when he scuffs his shoes on the pavement. I really should toss those sneakers. They're too comfortable to get rid of but there isn't really any sole left on the stupid things. Long story. Good sneakers. They don't leak through the sole when I walk through a puddle - yet. 10/10 will buy again the brand after I use up the "back stock" in the closet that I got for $20 a piece in close out. Eventually I knew Rack tired. He wanted to drink. Actually he wanted to drink the pool which isn't exactly a good idea with a salt system pool. Since it just makes you more thirsty. I started to follow him around. Looking for Just That Right Picture. I know. I have dozens, if not hundreds of pictures of Rack in the year since we met. I wanted more. Awww look at the puppy. It is like the story of the comic who was asked about children. She didn't think babies were all that beautiful. There is a rare one that she would comment from the heart. But for the most part she thought they were pretty ugly. She'd just say enthusiastically "Its a Bay Beeee!!!!" and move on quickly. That's what most people think when they hear a pet-parent raving on about their cat, parrot, lemur, monkey, cow, or dog. "It's a Doggie!!" And walk away. But... But... It's MY Doggie. Yeah, well, I'm still looking for That Picture and Rack doesn't like it. I blame the flash. If you want to take a picture of your pet - do it outside. They won't learn Camera Equals Flash so quickly. I ended up with the tip of the ear snipped off of the frame, and it saved me from sending a picture of my sneakers to someone again. Oh and keep a few topical shots in the smartphone just to send off as a random comment to people. 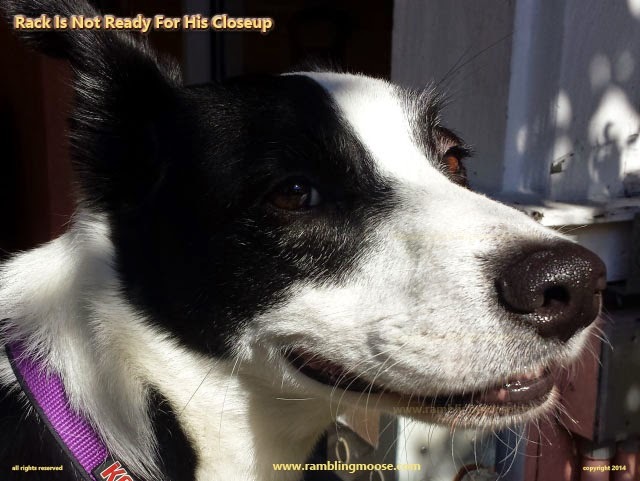 It keeps them guessing when your dog isn't ready for the closeup.